Still living at home with her mother and sister, engaged to the RIGHT boy from a good Italian family, Frankie’s life seems to be going down a very “traditional” path…until she discovers a dead body in the trunk of a rental car, messing up a perfectly good New Jersey gig for her band. Meanwhile, her sister, Heather - who can’t get enough of anything Mafia, including being obsessed with the cult phenomenon TV show MOB HIT - sees an open door, and she's determined to go through it – right to the funeral. At the wake, Frankie and Heather meet two people for whom the Mafia isn't a television show. Nicolette Bellafusco manages wedding bands and also happens to be the sophisticated daughter of Caesar “The General” Bellafusco, a new don in the Mafia. Heather is captivated by Caesar, Nicolette is captivated by Frankie, and Frankie can’t wait to get the hell away from it all. That, however, is easier said than done. Not only are the Feds swiftly on Frankie, questioning her about her new Mafia friends, but Nicolette shows up at the band's next gig – and offers to manage them, triggering something in Frankie she would have never imagined. As Frankie finds herself alienated from her fiancé and – ambivalently – growing closer to Nicolette, she manages to cast herself as a featured player in a full-scale conspiracy against Bellafusco, wherein only she knows who is really out to get him. 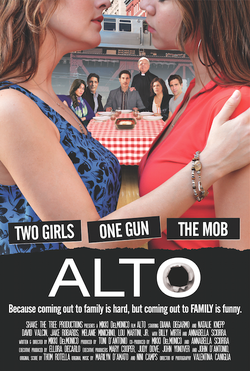 Unexpectedly paralleling the very stories she detests in “Mob Hit," caught between her planned marriage to Tony and her growing attraction to Nicolette, Frankie is finding out that the most surprising discoveries often come when we least expect it, in the midst of murder plots, federal investigations, and oh yeah, lasagna.